Typical NK cell-mediated killing involves accessory signaling or interactions in order to induce NK cell activation and downstream cytotoxicity. NK-cells can be activated by antigen presenting cells and/or multiple cytokines. To examine direct NK cell-killing, there are two methods. One, the purified NK cells are genetically engineered to identify, bind to and kill target tumor cells. Two, human PBMCs containing NK cells are further stimulated with IL-2 to induce a more robust activation and promote target cell killing. 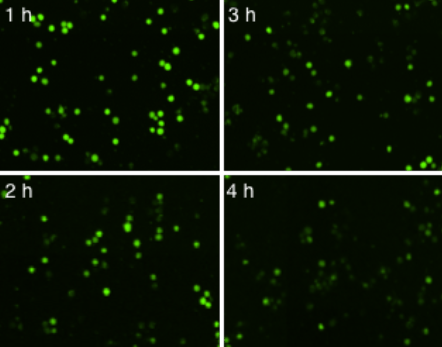 Traditionally, cytotoxicity assays have been performed using Chromium-51 release, LDH release, Luciferase Reporter Assay and fluorescent release assays (described below). Alternatively, by labeling the target tumor cells with non-toxic, non-radioactive calcein AM, we can monitor the killing of the tumor cells by the immune effector cells by performing a calcein AM release assay. Prepared two target cells lines IMR32 and K562. 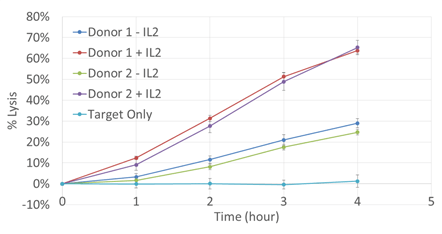 Added effector NK-cells at different E:T ratios. Representative 4 hour bright field and calcein AM overlay images showing E:T ratio dependent cell killing. calcein AM-labeled target cells are not killed in the control image, while nearly all of the target cells are killed in the 5:1 effector to target cell sample. The percent lysis is plotted to show the effect of E:T ratios on target IMR32 and K562 cells. Live adherent IMR32 cells were directly measured using the Celigo without trypsinization. The number of calcein AM positive cells at t = 4 hrs was used to calculate the percent lysis for each E:T ratio. The percent lysis is plotted to show the effect of E:T ratios on target IMR32 and K562 cells. 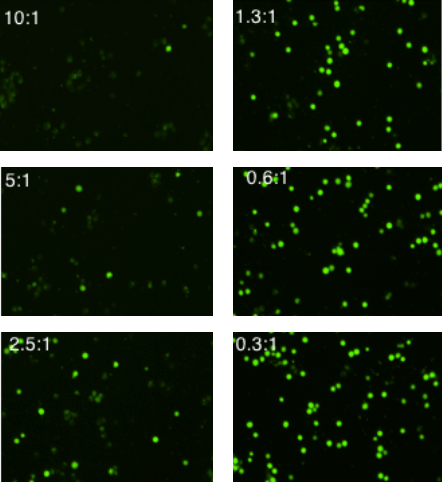 Live adherent IMR32 cells were directly measured using the Celigo without trypsinization. The number of calcein AM positive cells was counted at each hour and obtained cell numbers were used to calculate the percent lysis for each E:T Ratio. By analyzing the time course data of IMR32, we can see that there is a large percent lysis difference between the E:T Ratio. A greater percent lysis was observed in samples at a high E:T ratio with IL-2. 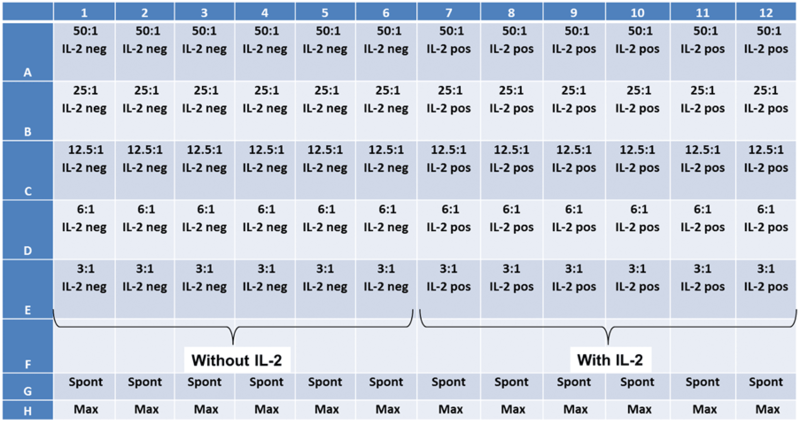 Overall, even at lower E:T ratios, the percent lysis was greater in samples containing IL-2. Percent lysis was observed above the target only control for all samples. Donor samples with IL-2 showed a great percent lysis compared to the no IL-2 samples.